Paperback, 9.5 x 12 in. / 104 pgs / 56 color / 11 bw. 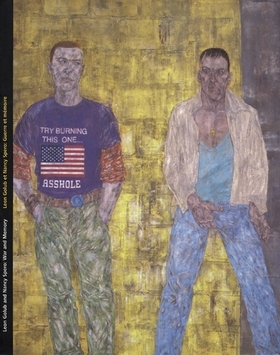 Artwork by Leon Golub, Nancy Spero. Contributions by Katy Kline. Text by Helaine Posner. Leon Golub and Nancy Spero, artistic and marital partners for over 40 years, have created two sustained and uncompromising bodies of work that explore themes of power and vulnerability by confronting the social and political realities of our time. Golub's primary subject has been male aggression and its vulnerability; his large scale canvases are searing visions of brutality, violence and agony. Spero's art has been concerned with degrees of human suffering. In extended series such as Torture of Women, she links sadistic sexuality to the abuse of power, combining ancient and contemporary tales of gynophobic violence. Published to accompany the exhibition at the List Visual Arts Center at MIT. War and Memory includes an overview of the artists as well as an essay by curators Katy Kline and Helaine Posner. FORMAT: Paperback, 9.5 x 12 in. / 104 pgs / 56 color / 11 b&w.